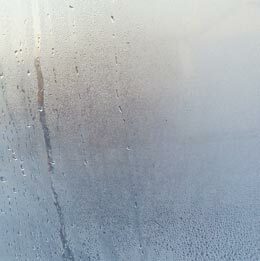 Condensation in bathrooms is something that most homeowners will come across. Water droplets can develop on mirrors, windows, and walls. These droplets occur when the cold surfaces in the bathroom come in contact with warm moist air. Bathrooms with warmer air hold more moisture. One way to avoid condensation in bathrooms is to make the room well-ventilated. When the bathroom is well-ventilated, it is drier because there is an outlet for the excess moisture. The easiest way to ventilate the room is to open a window. Make sure the window is open when someone is showering or bathing. Ceiling exhaust fans are another way to ventilate a bathroom. The fans will relieve the bathroom of excess moisture. To maintain ceiling exhaust fans, clean them regularly. If they accumulate dust and dirt, they will not properly ventilate the bathroom. If a home is in a particularly humid area, the bathroom may require a portable dehumidifier. A portable dehumidifier will remove excess moisture from the air and reduce the humidity levels. Humidifiers come in many shapes and sizes so that they will be a good fit for even the smallest bathroom. Proper heat and insulation could also help with condensation in the bathroom. If the heat in the home is turned up, it will warm the bathroom and as a result, warm the cooler surfaces in the bathroom. These cold surfaces have a tendency to attract the most condensation. While condensation in bathrooms is a common problem and something that most homeowners will face, it can lead to serious problems. Excess moisture can lead to mold and poor air quality. If you are noticing an abnormal amount of condensation in your bathroom, you should contact a professional plumber. A plumber in NYC will be able to check the bathroom for any underlying issues. Additionally, a professional plumber could help with the installation of a ceiling exhaust fan or fix any problems with the thermostat.